when fall rolls around, it seems like everyone is running out to grab one of starbucks’ delicious + addictive pumpkin spice lattes. while they are undoubtedly good, spending $5 on one drink feels a little ridiculous, especially if you’re picking up a few every week. dropping $50 at starbucks each fall? no thank you. especially now that we can recreate the pumpkin spice latte at home. surprisingly, these are not difficult at all to make + are, i think, even more delectable than starbucks’ version. how fantastic are these? they’re so delicious that i carried mine around like a precious gem, cooing at it. they’re so delicious that my non-coffee-drinking honey even tried it, proclaiming, ‘wow, this is really good … for a coffee drink’ (that might not seem like much, but trust me, it is). absolutely give these a try – i promise, you will not be disappointed. this insanely yummy wonderdrink is also amazing when chilled. i made enough for two large lattes, so i drank one on the spot, then chilled the other. 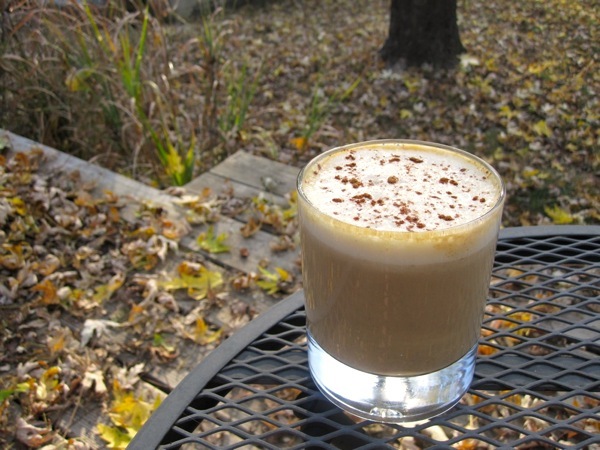 i’m drinking my iced pumpkin spice latte as i type + it is heaven in a glass. note: for the health-conscious, try using skim milk instead of whole, a sugar substitute in lieu of sugar, + omit the whipped cream – that will greatly reduce the fat / sugar in this drink. in a saucepan combine milk, pumpkin + sugar, + cook on medium heat, stirring, until steaming. remove from heat, stir in vanilla + spice. transfer to a blender + process for 15 seconds until foamy. if you don’t have a blender, whisk the mixture well with a wire whisk. pour into two mugs. add the espresso on top. optional: top with whipped cream + sprinkle with pumpkin pie spice, nutmeg, or cinnamon. Oh this looks so good!! Gorgeous pictures. thanks, erin! i’m still trying to get the hang of this camera/lighting thing. learning, definitely slowly, but learning! Previous post: smoked jalapeno burgers + a giveaway!